OBG Business Barometer: Saudi Arabia CEO Survey Copyright (c). All rights reserved. This survey has been designed to assess business sentiment amongst business leaders (CEOs or equivalent) and their outlook for the next 12 months. Unlike many surveys, the OBG Business Barometer is conducted by OBG staff on a face-to-face basis, across the full range of industries, company sizes and functional specialties. The results are anonymous. OBG provides this survey, infographics and accompanying analysis from sources believed to be reliable, for information purposes only. OBG accepts no responsibility for any loss, financial or otherwise, sustained by any person or organisation using it. For further information on the content of the survey, please contact: Billy Fitzherbert, Regional Editor, Middle East, at bfitzherbert@oxfordbusinessgroup.com. 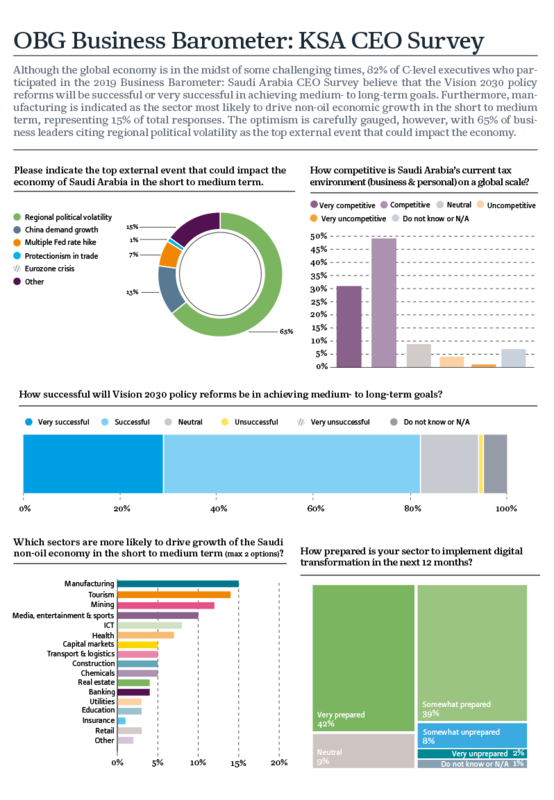 Should you wish to reproduce any element of this survey, infographics and accompanying analysis please contact mdeblois@oxfordbusinessgroup.com. Any unauthorised reproduction will be considered an infringement of the Copyright. For further details about OBG and how to subscribe to our widely acclaimed business intelligence publication please visit www.oxfordbusinessgroup.com.